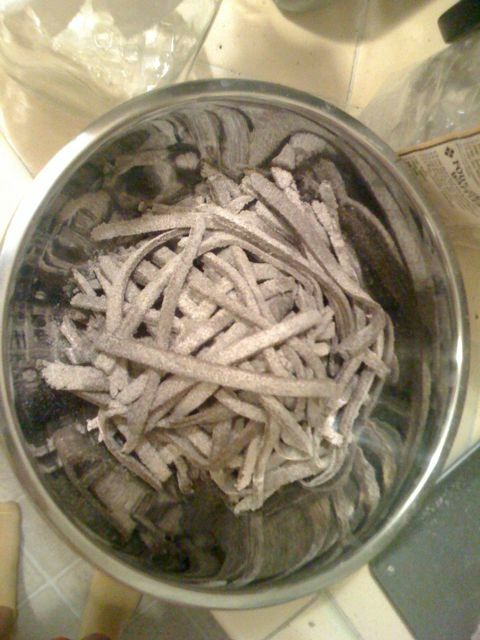 Last night I started a batch of Buckwheat Soba Noodles (which is a kind of redundant title). I found the recipe at Nourishing Gourmet and bought some buckwheat flour to try it! 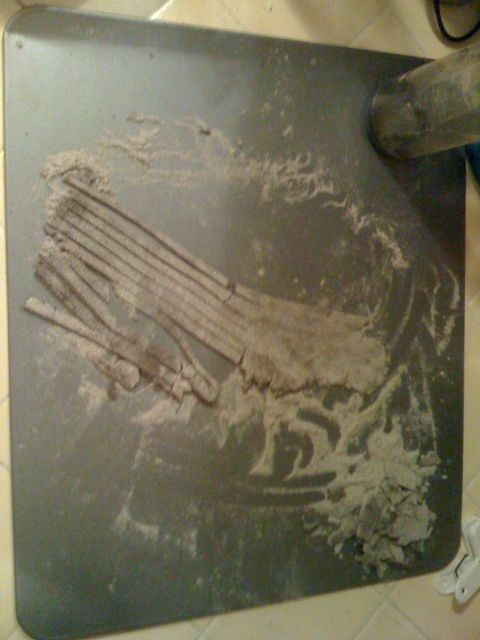 Unfortunately, when I got home I got excited about making buckwheat cookies and forgot all about the noodles, until last night. So I mixed the soaking ingredients, kneaded the dough and left it to soak over night. Tonight I rolled them out into flat pieces and cut them into strips! They stuck together pretty well. Even so, I was skeptical. But here they are cooked! They weren’t so good raw, but once they were cooked they were really tasty! And my husband, who hates brown rice noodles and longs for the wheat noodles of his ignorant past, really liked them too! 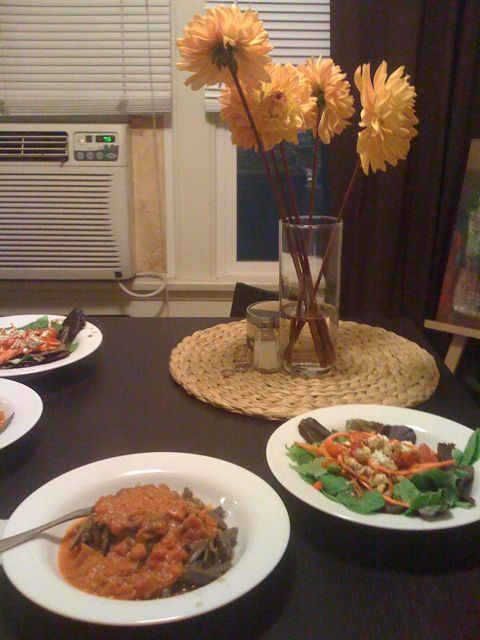 We had them with a Trader Joe’s Vodka Sauce and a lovely salad that Ryan put together. I think these noodles might be really good as ravioli or orzo. 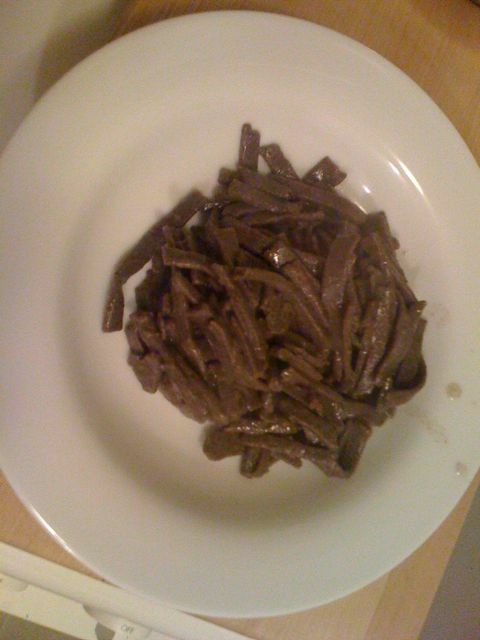 Maybe even bow-tie pasta! The possibilities are almost endless. Thanks to Kimi Harris for a great, easy-to-follow recipe! By the way, the cookies needed more butter. And I should have used sugar instead of stevia for the buckwheat to really sing.